The following letter of Thomas B. Linn, a drummer in the 16th OVI, was transcribed by contributor John M. Pierson who obtained it from Mary Bavender. The letters were part of a collection of papers from Linn and included a detailed diary. Combined, the letters and diary entries give us an intimate look at the life of a soldier in the 16th OVI during the Civil War. These letters were all written or received while Linn was a Private in Company B. 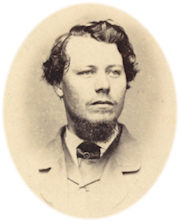 He was later promoted, on July 1, 1864, to Principal Musician, as a drummer, and transferred to Field & Staff. He survived the war and mustered out with the regiment on October 31, 1864, near Columbus, Ohio. This letter is addressed to L.S. Research by contributor John Pierson uncovers some confusion. Pvt. Linn married an Elizabeth Shafer in November, 1864, just a few weeks after mustering out of the army. In his letters, Tom used the nickname Lizzie and it is likely most letters addressed to L.S. were to his future wife, Elizabeth Shafer. However, Tom also was acquainted to a Lizzie Shera and may have also written to her. Research continues. I must tell you what kind of a climate I am in. It is so changeable that no dependance can be put in it all. One day it is as warm and pleasant as a northern summer. Such is today. The next day may be as cold as Greenland. Just as the wind blows we have it cold or warm. Last Wednesday afternoon the wind shifted to the North-West and by dark was blowing "big guns" as cold as if it had just left the frozen regions of the North Pole and blowing the sand into large drifts and putting one greatly in mind of them. By eight o'clock it was blowing so hard that we were compelled to let our tent down to prevent it from being torn to shreds, several ropes already having given away. Some of Co. A's tents were torn to pieces before morning. You will wonder how we slept that night. We left our tent down fastened guns to the sides and crawling under them held fast. I and my bedfellow Raymond Fenner had three blankets and our tent over us and yet the wind came through and we slept cold. Newt Gorsuch and I do not bunk together now - as good friends as ever though. But this a digression. Morning came at last and we found fully a peck of sand blown over us. The wind was still blowing as hard as ever. About ten o'clock the wind began to go down and in the afternoon it became warmer. We put up our tent again, shut up the ends with dried cowhides and then threw up sand all around to give the wind no chance to get the advantage of us again by getting in under our canvass. We now have a real snug little house as gay a one as in the row and so just let the wind blow and the rain descend and then if we can't keep dry we will, like the philosophers, just let it rain and take it like heroes as we ought to be. I suppose it is winter up there and the merry jingle of sleighbells are frequently borne to your ears as they lightly skip over the smooth surface of the snow covered pike. I hope to pay up the long promised sleigh ride with interest doubly compounded next winter but you must not break any more watch guards for me or I fear I shall never get out or your debt. I am so slow paying I fear you will not trust me again. Now that John has gone to drive team for the Army what will my poor Lizzie do for a gallant to take her sleighriding this winter? I will have to court-marshal him. By next winter I hope to take my own place. I hope you will have a pleasant visit to Brookville and lots of fun to tell me of when you return. You may perhaps see or hear of Adam while there and learn how he flourishes. It seems as if there was something else I wished to say this time but I cannot think of it and it is nearly dress parade time will have to close.